Vermont Sen. Bernie Sanders announced he will make a second bid for the Democratic nomination for president. After months of deliberation, Vermont Sen. Bernie Sanders announced Tuesday that he is running for president again in 2020. It will be Sanders' second consecutive bid for the Democratic nomination after losing to Hillary Clinton in 2016. 'I am asking you to join me today as part of an unprecedented and historic grassroots campaign that will begin with at least a million people from across the country,' he wrote in an email to supporters following an interview on Vermont Public Radio. Sanders enters the 2020 race as one of the frontrunners -- a remarkable turn for the democratic socialist who, three years ago, was viewed as a protest candidate from the political fringe. Today, Sanders is one of the most popular politicians among Democratic voters and his policy agenda -- a suite of progressive proposals to expand health care, broaden the social safety net and make higher education free -- has been embraced by many of the Democratic party's leading figures. 'I can tell you very happily, and I think any objective observer would confirm what I'm saying, is that in the last year and half or so, the Democratic party has moved in a far more progressive direction than they were before I ran for president,' he said in an interview with CNN last year. But in the run-up to his announcement, Sanders and top aides insisted the decision would ultimately turn on a much simpler question: whether he was the best candidate to defeat President Donald Trump next year. But in his Tuesday morning email and video announcing his run, Sanders -- who described Trump as 'a pathological liar, a fraud, a racist, a sexist, a xenophobe and someone who is undermining American democracy as he leads us in an authoritarian direction' -- also set out loftier goals. By 7:30 a.m. ET, an aide told CNN, the campaign had received donations and sign-ups from all 50 states. Sanders, 77, begins his campaign this time around with a higher profile and better organized base of support, but rather than having a single establishment favorite to fight, perhaps a dozen other candidates with wide and often overlapping appeal are already pursing the nomination. That includes as many as a half-dozen credible progressive hopefuls who, though not social democrats in the Sanders mold, share many of his policy priorities and political style. The primary field will also be more racially diverse and, on average, younger. Less than two months into the year, five of his Senate colleagues are either running or exploring campaigns, including four of the six women in the race. And though he has joined the race now earlier than he did at this point in 2015, Sanders' entry comes in the wake of about a dozen others, like Massachusetts Sen. Elizabeth Warren, another progressive populist, who announced the formation of an exploratory committee on New Year's Eve and formally declared her candidacy 10 days ago. She quickly scooped up Sanders' 2016 Iowa caucus director and has already traveled to six key states and Puerto Rico. But Sanders' increased influence has also invited stricter scrutiny from the political opponents, including a vocal faction inside the Democratic party who blame him for dampening support for Clinton ahead of her loss to Trump, the press and even some of his most dedicated advocates. Both Sanders critics and allies will keep a close eye on the makeup of his early hires, most notably his choice of a campaign manager to replace Jeff Weaver, who ran the show in 2016 and will remain on as a senior adviser. An aide told CNN in January that the process was already underway. There is also the question of whether influential progressives like New York Rep. Alexandria Ocasio-Cortez, who volunteered on Sanders' 2016 campaign, and traveled with him during the midterms to campaign for progressive hopefuls, will offer their public support. California Rep. Barbara Lee, one of the most respected progressive lawmakers in the country, endorsed Sen. Kamala Harris last week. Sanders' increased visibility has yielded substantial gains for the Democratic party's left flank and -- through an unlikely alliance with a Republican -- helped deliver a historic rebuke to the Trump administration's policy in the Middle East. Along with GOP Sen. Mike Lee and Democratic Sen. Chris Murphy, Sanders last year won bipartisan backing for a War Powers resolution calling for an end to military support for the Saudi-led offensive in Yemen. His pressure campaigns on major corporations like Amazon also helped secure a $15 minimum wage for workers there and a pledge from the company to back legislation raising it nationwide. 'He has reached out more to work with colleagues in the last few years to show that effectiveness and that's his biggest plus point on a substance level,' said Democratic Rep. Ro Khanna, who led the successful push for a matching resolution this year in the House. 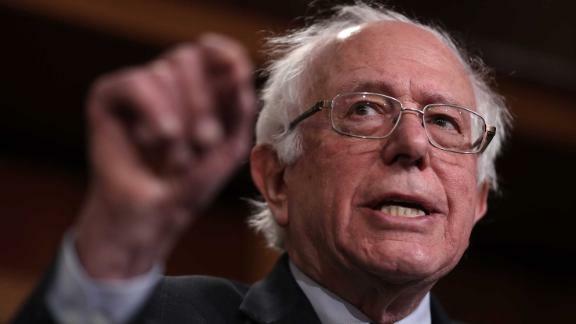 Over two weeks in January and February, Sanders unveiled plans to buy more than 50 years of padding for Social Security by raising payroll taxes on income above $250,000 and hike the estate tax on the wealthiest Americans -- suggesting a top rate of 77% on billionaire heirs.